It is becoming harder to argue that neoliberal market solutions, from tax cuts to deregulation, will necessarily benefit and protect ordinary voters. In the heady political days of late 2018, former treasurer Peter Costello argued that the Liberals need to unite behind a clear economic narrative. He claimed that this would avoid Liberal politicians defining themselves on the “social issues” that have divided the government. However, the ideological problems in the Liberal government go beyond the evident, and electorally damaging, differences over social issues. The Liberals’ economic ideology, which often cuts across their internal division between conservatives and moderates, may also be contributing to their electoral and policy difficulties. Is it now time for the Liberals to reconsider their free market, neoliberal economic policy narrative? It emphasises lower taxes combined with radical deregulation, privatisation, corporatisation, major cuts to government spending on services and the dismantling of Australia’s century-old industrial arbitration system. But it is a narrative that contributed to the 2014 budget cuts that helped undermine the Abbott government. It gave rise to the proposed tax cuts for big business that contributed to the poor 2016 election and 2018 byelection results. It also made it harder for the Liberals to accept a range of regulatory policy issues, including the need for a banking royal commission. Costello’s critics claim that his own tax cuts significantly reduced government revenue. This made it much more difficult for future governments to return the budget to surplus. The Liberals have always argued that they would be better economic managers than Labor; that they supported individual rights and free enterprise and opposed Labor’s so-called “socialism”. Nonetheless, their economic narrative has not always been the neoliberal, free market one that Costello and others have espoused from the Howard government on. As we shall see below, the Liberals originally believed in a more substantial role for government. Labor has been quietly moving away from some neoliberal positions that it embraced during the Hawke and Keating years. For example, it is now more supportive of government regulation and has re-embraced Keynesian perspectives that see a major role for the state in managing capitalist economic cycles. It has also questioned some neoliberal aspects of past Labor government industrial relations policy, such as an over-reliance on enterprise bargaining, acknowledging that this has contributed to reduced wages and conditions. The Liberals have introduced some electorally opportunistic economic measures. These include funding for industries in sensitive electorates, energy price measures and backing down on tax cuts to big business that they couldn’t get through the Senate. But they have not undertaken a major reconsideration of their economic ideology despite the related policy problems, from unpopular budget and tax cuts to originally opposing a banking royal commission. Robert Menzies believed governments should implement more economic controls, not fewer. Yet Robert Menzies, the founder of the party, decried laissez-faire economics and argued for more controls, not fewer. He boasted of reading Keynes, given that politicians need to know “a great deal about applied economics”. Menzies also championed the role of Liberal administrations in establishing an industrial relations arbitration and conciliation system that gave “to organised labour the basic wage, the standard working week, the protection of employees and the enforcement of their legally established rights”. Nonetheless, the Howard government largely abolished such a system in its neoliberal-influenced (and electorally unpopular) WorkChoices legislation. In short, the Liberals were originally more influenced by social liberalism, rather than neoliberalism, in that they were more willing to endorse state intervention to protect the welfare of citizens and the smooth functioning of markets. So why might it be important for the Liberals to reconsider some of their economic policy narrative now? Social democrats are fond of claiming that it has been their historical role to save capitalism from its own excesses, including during the Global Financial Crisis. However, social liberals can argue that they have also aimed to do that. Capitalism now faces some major policy challenges. The very neoliberalism the Liberals have championed since Howard has contributed to a crisis of consumption. In Australia, the weakening of both unions and arbitration protections, particularly industrial awards, has contributed to lower wage outcomes. Reduced consumption then has impacts on private businesses that have trouble selling their goods and services. Contemporary Liberal governments have tended to respond to cost-of-living pressures by arguing they will cut taxes and energy costs while Labor will increase them. However, negative campaigning against Labor’s tax and energy policies may prove insufficient to allay voters’ concerns about low wages growth. Meanwhile, voters may be less convinced by arguments for free markets and light-touch regulation in the wake of the disturbing findings of the banking royal commission. This is despite the government’s belated pledges to take action, including on regulatory issues it had previously rejected. There is also evidence, at both federal and state level, that neoliberal deregulation, privatisation and outsourcing of government functions have contributed to dysfunction in many areas. Examples include high-rise building safety (for example, structural failures and flammable cladding), and the pharmaceutical industry. The Royal Commission into Aged Care, initiated by the Morrison government, is likely to reveal further regulatory failures in both design and implementation. Federal and state governments have repeatedly proved naive in their belief that inadequately regulated industries will put the needs of ordinary Australians before the pursuit of financial gain. Consequently, they risk doing too little, too late. A neoliberal belief in free markets has arguably contributed to the Liberals’ inadequate efforts to address serious market failures in areas ranging from climate change to high-speed broadband. The neoliberalism that the Howard government embraced may no longer be serving the Liberal Party well. As well, Howard-era neoliberal beliefs, which saw people primarily as individuals and movements for social change as politically correct “special interests” attempting to rip off taxpayer funds, have contributed to a failure to address real issues of discrimination. The Liberals’ failure to deal with gender equity in their own party is just the latest manifestation. This from a party that a women’s organisation played a major role in establishing in the Menzies era, winning quotas in party governance structures as a result. Importantly, all of this is happening just as the international economy is entering a period of considerable uncertainty. This calls for careful government management of the economy and its social effects. The trade tensions between China and the US reflect broader geopolitical and economic challenges to the West as Asia rises. Technological disruption is likely to increase unemployment, including through offshoring jobs. Developments in biotechnology will pose major ethical and regulatory challenges for governments. For all the above reasons, it is becoming harder to argue that neoliberal market solutions, from tax cuts to deregulation, will necessarily benefit and protect ordinary voters. Public support for government spending on services is rising. Voters have lost trust in politicians and the ability of governments to look after them. The Liberals’ current economic narrative leaves them particularly vulnerable to Labor’s claims they primarily support the big end of town. Whether they win the 2019 federal election or find themselves back in opposition, it may be time for the Liberals to reconsider their attitude to the role of government in providing services and regulating markets effectively, while still claiming that they are more supportive of private enterprise and are better economic managers than Labor. The challenges of 21st-century Australia may require the Liberals to draw on some of their earlier, social liberal, perspectives. You know you’re not supposed to do this – but you do. How did you sleep last night? If you had anything other than eight interrupted hours of peaceful, restful sleep then guess what? It’s not that bad – it’s actually pretty normal. We recently asked five sleep researchers if everyone needs eight hours of sleep a night and they all said no, you don’t. We asked five experts: does everyone need eight hours of sleep? In fact, only about one quarter of us report getting eight or more hours of sleep. That’s according to the huge annual Household, Income and Labour Dynamics in Australia (HILDA) survey which now tracks more than 17,500 people in 9500 households. We’ll hear today from Roger Wilkins, who runs the HILDA survey at University of Melbourne, on what exactly the survey found about how much and how well Australians sleep. Trust Me, I’m An Expert is a podcast where we ask academics to surprise, delight and inform us with their research. You can download previous episodes here. And please, do check out other podcasts from The Conversation – including The Conversation US’ Heat and Light, about 1968 in the US, and The Anthill from The Conversation UK, as well as Media Files, a podcast all about the media. You can find all our podcasts over here. The two segments in today’s podcast were recorded and edited by Dilpreet Kaur Taggar. Additional editing by Sunanda Creagh. I can’t sleep. What drugs can I (safely) take? Morning Two by David Szesztay, Free Music Archive. But how many non-prudent borrowers have there been in the Australian property market in recent years? Hint: a lot. Here in the business and economy team at The Conversation, we love charts. This year we’ve made plenty of good ones with academics. There were the charts that showed how the wealth gap between old and young was growing and how this was affecting mortgages and home ownership. Then there were the ones on how our workforce is changing (and how we’re discriminating in it) and what this means for unions. Charts have a way of showing us that we can be wrong about our thoughts on, say inequality in Australia and financial vulnerability. But it would be wrong of us to finish the year without just a few more charts, three in fact. We’re hearing a lot less of the “jobs and growth” and the “innovation” mantras from Prime Minister Malcolm Turnbull and Treasurer Scott Morrison. Maybe Jesse Stein was right when she suggested at the start of 2017 that it was time to ditch the spin around innovation. It got a very small mention in the Federal Budget, but it’s been hard for the government to make it stick to other policies too. Speaking of other policies, there’s not much doing in jobs either. Despite the enthusiasm about recent unemployment figures, underemployment (where you can’t get enough hours despite having a job) remains high. For those who don’t have a full time job, like young people in the arts or services industry, it seems the pay off of casual work ain’t what it used to be either. So far, Amazon’s Australian launch has been a bit of a fizzer. But tales of impending retail “decimination” were everywhere this year. At The Conversation, Gary Mortimer correctly predicted that Amazon won’t be the end of shopping as you know it. At least so far. But this isn’t the end of the story. The likes of JB Hi-Fi and Harvey Norman will likely feel the heat, considering Amazon’s scale. And shopping centres are already scrambling to offer customers something new. More worrying are the implications for Australia’s tax system and industrial relations given Amazon’s business model. Now that Amazon is finally here, it’s time to start thinking about what it means for our own habits. Should we “click and collect”? And what’s with everyone trying to sell you a subscription box? One Bitcoin, as of mid day on December 15, was worth about A$22,000. That could buy you more than 6,000 avocados (because who wants a house anyway), 1,375 kilograms of Vegemite, four Chinese crested dogs or a small to mid-sized car. Although you’d have to have at least two Bitcoins to buy a Tesla Model 3 Roadster, but as Tesla is not yet ready to deliver this model in Australia, you may want to wait until you only need one Bitcoin. But of course Bitcoin is a cryptocurrency so unless you exchange it for cash at the right time, all these comparisons are meaningless. In fact we’re not quite sure how to value Bitcoin even though we know why the price might be skyrocketing and how much energy it is guzzling. All we can do is look back on bubbles and crashes of old and hope next year won’t see the worst case scenarios come true. Self-checkouts in supermarkets are increasing as businesses battle to reduce costs and increase service efficiency. But looking at the numbers, it isn’t clear that self-service is an easy win for businesses. Self-checkouts aren’t necessarily faster than other checkouts, don’t result in lower staff numbers, and there are indirect costs such as theft, reduced customer satisfaction and loyalty. Worldwide, self-checkout terminals are projected to rise from 191,000 in 2013 to 325,000 by 2019. A survey of multiple countries found 90% of respondents had used self-checkouts, with Australia and Italy leading the way. Employment in the Australian supermarket and grocery industry went down for the first time in 2015-16 and is projected to remain flat for a few years. But staff numbers are projected to rebound again, in part due to the need to curtail growing theft in self-checkouts. There are a couple of intertwining trends that explain the rise of self checkouts. We now visit our supermarkets more frequently than ever before, two to three times per week in fact. This means our basket contains fewer items and being able to wander up to a self-checkout, with little to no wait time, has been an expedient way to shop. Most shoppers consider self-checkouts both fast and easy to use. Although this varies with age – 90% of shoppers aged 18-39 found self-service checkouts easy to use, only 50% of those over 60 years said the same. Shoppers also gain value from taking control of the transaction – being able to ring up their own goods and pack them the way they want. This is because a sense of control over their own shopping can lead to greater customer satisfaction and intent to use and reuse self-serve technology. Wages represent around 9.5% of supermarket revenue in Australia, and reducing wages is one of the reasons proposed for the uptake of self-checkout. But from a business perspective, moving from “staffed” checkouts to self-serve machines isn’t cheap. A typical setup costs around US$125,000. On top of that there are the costs of integrating the machines into the technology already in place – the software and other systems used to track inventory and sales, and the ongoing costs – to cover breakdowns and maintenance. But the biggest direct cost to retailers of adopting self-service checkouts is theft. Retail crime in Australia costs the industry over A$4.5 billion each year. There is reason to believe that rates of theft are higher on self-service machines than regular checkouts. A study of 1 million transactions in the United Kingdom found losses incurred through self-service technology payment systems totalled 3.97% of stock, compared to just 1.47% otherwise. Research shows that one of the drivers of this discrepancy is that everyday customers – those who would not normally steal by any other means – disproportionately steal at self checkouts. 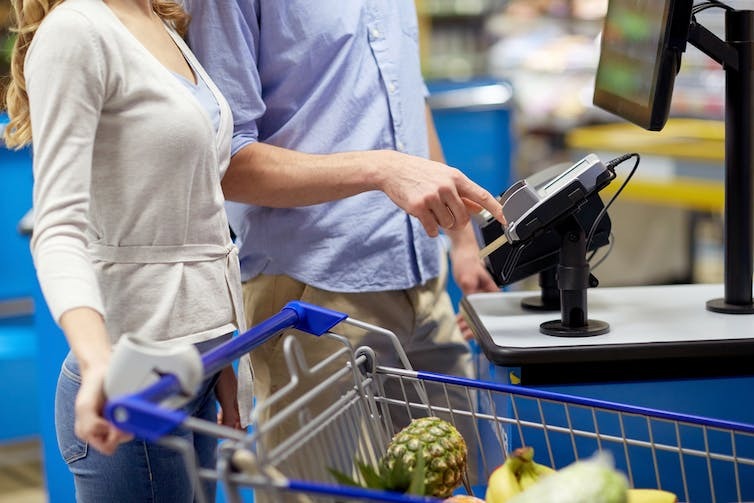 Studies also show that having a human presence around – in this case employees in the self-checkout area, increases the perceived risk of being caught, which reduces “consumer deviance”. This is why retailers have been adding staff to monitor customers, absorbing the additional losses, or passing them on to customers in an “honesty tax”. 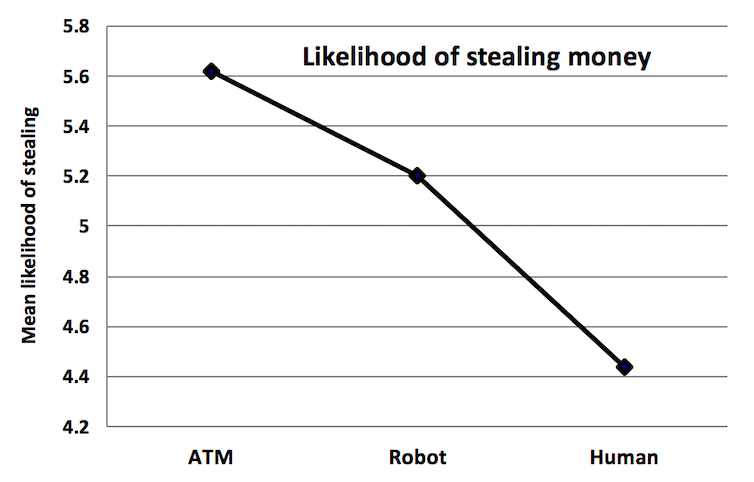 As you can see in this graph, preliminary work by researchers Kate Letheren and Paula Dootson suggests people are less likely to steal from a human employee than an inanimate object. Not only because they will get caught, but because they feel bad about it. On the other hand, consumers have plenty of justifications to excuse self-checkout theft, which is leading to its normalisation. To combat this, researcher Paula Dootson is trying to use design to combat deviance. One of the ways is through extreme-personalisation of service to reduce customer anonymity. Anonymity is an undesirable outcome of removing employees and replacing them with technology. Other ideas are to include moral reminders prior to the opportunity to lie or steal (such as simply reminding people to be honest), and to humanise the machines by encoding human characteristics to trigger empathy. While self-service technologies will continue to be adopted by businesses broadly, and particularly within the retail sector, it will be important for retailers to take a holistic approach to implementation and loss prevention. Self-service technology reduces front line staffing costs and increases efficiency by re-distributing displaced staff into other service dominant areas of the business, but it creates unintended costs. These business costs can be direct, in the form of theft, but also indirect costs, like reduce customer satisfaction and loyalty. Something that some supermarkets are focusing on today. Now that the first stage of a cut to the corporate tax rate has been passed by the Senate it’s clear the benefits are more political than economic. The cut may signal to the world that Australia wants to be competitive on corporate tax, but it won’t make much of a difference to our largest businesses and multinationals. The government has secured a cut to businesses with a turnover of under A$50 million, with companies with a turnover of less than A$10 million receiving a reduction in their tax rate (to 27.5%) this financial year. But the second stage of the tax cut is still to be passed, that would give a cut to businesses with a turnover of A$100 million in 2019-20. Arms of multinational companies often pay a much lower effective tax rate when compared to their parent company. Until politicians across the globe can agree how to ensure companies pay tax on local earnings, which appears unlikely in the near future, tax rates will remain a signal to multinationals on where to base their business. The tax cuts have been strongly supported by big companies and even more so by the Business Council of Australia. A major reason put forward by the business community is the need to stay competitive in a global environment. Our major trading partners such as the United Kingdom and United States are planning to drastically reduce their corporate tax rates and countries such as Ireland (12.5% on corporate trading profit) and Singapore (by 2018 20% capped at $20,000) already have very low corporate tax rates in place. Multinational corporations have the ability to profit shift to lower taxing jurisdictions. For instance, a multinational can employ tax accountants to structure ownership of intellectual property in a low taxing jurisdiction and reduce gross income by license fees, or via debt loading to a parent company. Tax avoidance is often siphoned through a non-reporting subsidiary, so these accounting tricks occur without the glare of public scrutiny. In other instances multinationals have been able to completely bypass Australian tax by booking revenues overseas. This is usually to make it seem like the company has increased its profits, making it appear better to shareholders. However there have been no studies specifically relating to how companies might do this in relation to revenue (what the Australian government is considering for the tax cut). There’s also something unique to Australia which means private companies pay less tax and that’s dividend imputation. This is designed to eliminate the double taxation of dividends in the hands of Australian shareholders. Since it’s introduction in 1987, dividend imputation has provided strong incentives for firms to pay the full statutory tax rate on all reported profits. The tax paid on dividends flowing to Australian shareholders of Australian companies is reduced by an amount equal to the tax already paid by the corporation, this is known as imputation credits. A shareholder’s marginal tax rate, and the tax rate for the company issuing the dividend, both affect how much tax an individual shareholder owes on what is called a fully franked dividend. Companies that pay fully franked dividends in Australia, pay on average over 10% additional tax on the same level of earnings than companies not paying franked dividends. Approximately 62.3% of imputation credits are utilised by resident shareholders. The average effective tax rate of Australia’s largest private companies are much lower than that of the largest public companies (most of which pay fully franked dividends). You can see this in the table below which shows the effective tax rates calculated by two separate studies. One of the studies by the union United Voice looked at the ASX200 companies and the otherby lobby group GetUp examined the largest private companies operated by foreign multinationals. At best the tax cut may somewhat reduce the burden on smaller Australian companies, albeit at a significant cost to the budget, without impacting the largest Australian and foreign multinationals. Although prospects for further tax cuts for the big end of town (which has a greater impact on the economy) are unlikely in the next five to 10 years without Senate crossbencher support. The link below is to an article that comments on the G20 meeting in Australia and the current situation for Australia in the G20.